Hi everyone, today I have a Christmas card to share with you and this will (hopefully) be the first of quite a few festive cards. I'm also entering this week's DP2 challenge to use your fave Mo image. This is my fave (at the moment) 'cos it's the newest, but how anyone could have just one favourite image from Mo defeats me! I was really starting to go into panic mode about getting my xmas cards made. I started the year off quite well by joining in with a few of the Christmas Challenges, mainly because I thought they would help me avoid my normal last minute rush but then, due to preparing to move etc. it all ground to a halt and I haven't made any since heaven knows when. Fingers crossed, I still have time to get enough cards made before December is upon us. * Papers - Papermania 'Naughty & Nice' and unknown papers from a friend. I try to avoid a visit to Mo's Digital Pencil too often as I find it nearly impossible to choose just one or two images, she is so talented that I always want everything in her shop. So this time I made a short list of about half a dozen digis in my basket and then asked DH to help me choose, the 2 images I bought were actually both his choice. Don't you just love the hopeful expression on that little dog's face, I wonder what he wants in his stocking? What a cute card! The papers are wonderful with that sweet image! Glad you joined us in Mo's Challenge. This is adorable Chrissie and a great choice by hubby. I know the feeling about the move, I am way behind now and I was doing so well. 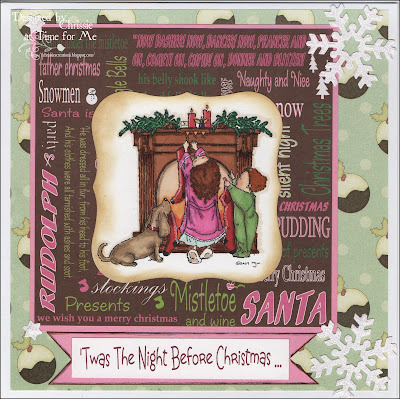 So gorgeous card Chrissie,I love the image and the colours. Wow, an 8 x 8 card! I thought I made large cards! But one this fantastic should be large!! That scene is so warm and inviting with so many fun things to look at! Beautiful keepsake for that special person who will love it! Sending big hugs! Oh Chrissie this is beautiful, the papers and that image are a pure delight.